I’m sure we all read because we like a good story but aren’t we equally keen on writing which ignites our imagination? Writing that connects us with our subconscious, our emotions and dreams? Angela Carter knows how to tell a story but more than that, she inspires. She makes us think, explore, dream, fantasize, question. Sometimes it’s not even important to understand every aspect of her short fiction but just to read one of her wonderful sentences, discover one of her splendid images is enough. The short story collection American Ghosts and Old World Wonders is such a treasure trunk. 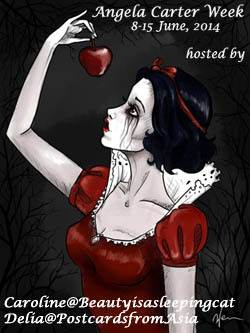 It’s full of retellings, deconstruction, parodies, reimagining of old myths, fables and fairy tales. It wasn’t always a breezy read. I had to hunt for a few academic papers in order to fully understand the one or the other of the pieces in this book. Like in all of her collections, there were a few stories that stood out and I’ve even found a new favourite. 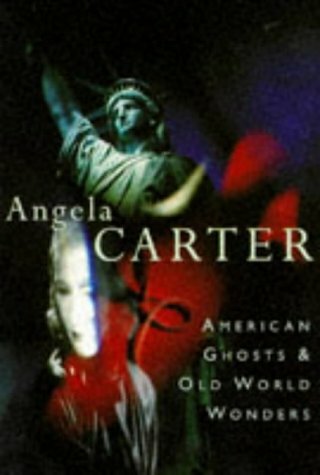 In this collection Angela Carter mixes myths and elements of the American Dream and/or of America as the land of dreams, the country of one of the biggest movie industries, the country of serial killers and westerns, of endless possibilities, and juxtaposes these elements with stories from the old world – fairy tales and history. The result is stunning. The book is divided in two parts. I’d call the first the “American” part and the second the “Old World” part. Lizzie’s Tiger is the second Lizzie Borden story she wrote. It shows us a young fearless Lizzie who discovers the magical world of a circus and a tiger who’s living in it. It’s as much an allusion to Blake’s famous poem as it is an imagination of a time when Lizzie was still small and had options to become someone else. John Ford’s ‘Tis Pity She’s a Whore is a pretty tongue-in-cheek and cheeky piece. What if the film director John Ford made British playwright John Ford’s drama ‘Tis Pity She’s a Whore into a movie? Well – read her story and you’ll find out what that would be like. Gun for the Devil is another Western type story set near the Mexican border. Johnny get’s a gun and frees a girl. Sort of. The story contains an allusion to the movie Johnny Got His Gun. The Merchant of Shadows is my favourite story in the book and has become one of my all-time favourites. A story of decay, exuberance, mystery, set in a decadent Hollywood setting, reminiscent of Sunset Boulevard (one of my favourite movies btw). A young academic comes to interview the widow of the famous film director von Mannheim (he seems inspired by von Sternheim). His widow was once a femme fatale but now she’s in a wheelchair, living with her sister who looks like a cowboy. A flight of rough-cut stone steps led up to a pool surrounded by clumps of sweet-smelling weeds; I recognised lavender. A tree or two dropped late summer leaves on scummy water and, when I saw that pool, I couldn’t help it, I started to shiver; I’ll tell you why in a minute. That untended pool, in which a pair of dark glasses with one cracked lense rested on an emerald carpet of algae, along with an empty gin bottle. On the terrace a couple of rusty, white-enamelled chairs, a lopsided table. Then, fringed by a clump of cryptomeria, the house von Mannheim caused to be erected for his bride. That house made the Bauhaus look baroque. An austere cube of pure glass, it exhibited the geometry of transparency at its most severe. Yet, just at that moment, it took all the red light of the setting sun into itself and flashed like a ruby slipper. I knew the wall of the vast glittering lounge gaped open to admit me, and only me, but I thought, well, if nobody has any objections, I’ll just stick around on the terrace for a while, keep well away from that glass box that looks like nothing so much as the coffin for a classical modernist Snow White; let the lady come out to me. No sound but the deep, distant bass of the sea; a gull or two; pines, hushing one another. So I waited. And waited. And I found myself wondering just what it was the scent of jasmine reminded me of, in order to take my mind off what I knew damn well the swimming pool reminded me off – Sunset Boulevard, of course. And I knew damn well, of course I knew, that this was indeed the very pool in which my man Hank Mann succumbed back in 1940, so very long ago, when not even I nor my blessed mother, yet, was around to so much as piss upon the floor. I waited until I found myself growing impatient. How does one invoke the Spirit of Cinema? Burn a little offering of popcorn and old fan magazines? Offer a libation of Jeyes’ Fluid mixed with Kia Ora orange? This passage shows something else that strikes me every time when I read Angela Carter – how she is at the same time irreverent and full of admiration for her themes. I liked the stories in part II a little less. ‘Twas the night before Christmas. Silent night, holy night. The snow lay deep and crisp and even. Etc. etc. etc. ; let these familiar words conjure up the traditional anticipatory magic of Christmas Eve, and then – forget it. Then In Pantoland – a parody of the way fairy tales have become a pure commodity, robbed of their deeper meaning and sometimes violent aspects due to the way Disney has used them. Ashputtle or The Mother’s Ghost contains three ways to deconstruct Ashputtle. Very different from Disnye’s Cinderalla. Night was. Widow Night, an old woman in mourning, with big, black wings, came beating against the window; they kept her out with lamps and candles. Impressions: The Wrightmans Magdalene is the reimagining of the story of Mary Magdalene. It references two artists’ representation: Georges de La Tour’s Mary Magdalene and Donatello’s Mary Magdalene. One a painting, the other a sculpture. This collection was a wild ride, at times challenging, but mostly really captivating and enchanting. This is the second review for Angela Carter week, co-hosted with Delia (Postcards from Asia). I love the fact that these stories are based upon stories and films that are tied to our culture. The Merchant of Shadows sounds very good in particular. I also love Sunset Boulevard. The allusion to Johnny Got His Gun seems intriguing. It’s not an easy collection but when you’re willing to read slowly and savour it, it’s worth the effort. Since I’m a huge cinema fan, a lot appealed to me. A think every story makes allusions to one movie at least. What a fascinating collection, Caroline. I’m a film buff too, so would probably enjoy these stories. Sunset Boulevard made my heart ache. William Holden’s best role in my opinion. Can’t imagine how they made it into a musical! They did? Yikes. I find the movie amazing. A musical doesn’t sound dignified enough. I loved this collection but it had challenging moments. The Merchant of Shadows is a stunning story. Sunset Boulevard is one of my favourite films (joining in the conversation). This collection sounds excellent, and for some unknown reason I’ve been attracted to short stories lately. This one goes on the list. Thanks, C.
I’m not surprsied to hear that. I’m actually glad I’ve got a DVD of the film. Time to re-rewatch it. I hope you’ll like the collection. I’m looking forward to read your thoughts. The first part is amazing, the second is a bit more challenging but still so full of movie allusions. Yes, they did, with Glenn Close, no less. I believe she won a Tony for it and probably brought some dignity to the production. Still, I don’t think I’ll watch it. This collection sounds really great and your fabulous post makes me want to rush out and buy it, except there is only one book store in my area and it only has bestsellers. Never mind. Book Depository to the rescue! The thing that strikes me about Carter is that she was just so intelligent and talented. She knew so much about so many things, and she could express herself beautifully. I don’t know much about the cultural references you mention regarding the stories in this book, so I will have to do some digging, too. I think that’s why I like reading Carter so much: it’s an immersive experience, and always really rewarding if we put in the effort. I think you’d like it. As the foreword says it shows a new Carter, one who’d have written even more orginal and daring books if only she’d have had the time. There isn’t much she dooesn’t know or was interested in. Some stories were really not easy to get. Some were rather like mini essays. I got this as a used copy. I’m surprised that the week went so well and that there were so many discussion and really pleased that quite a few people have discovered a new favourite and will go on reading her. Thanks you so much for participating, Violet. Whatever happened to the “Heroes and Villains” post? The link to Heroes and Villains must have been broken, but it’s working for me now. I was disappointed to find that BD doesn’t have this book at the moment. I’ll track down a used copy because I definitely want to read it. It’s really sad that Carter died so young. It would have been interesting to see how her style changed with the decades. Oh well. It is sad. I think she would have been one of those writing, exploring and doing something new well into her very old age. I’m glad I asked about the link then. It’s my favouriet Angela Carter so I’m very interested in the review. The Bloody Chamber was the same – if I tried to rush it, the story slipped out of my reach. But if I took my time to savour it, I saw things and felt things. And as I took the time to review each story and research them, more layers revealed themselves. It would seem that you’ve had a similar experience. Exactly, that’s how it was. I don’t think you can rush through anything she wrote. You’d miss out. Wonderful review, Caroline! I loved the quotes from ‘The Merchant of Shadows’ and ‘Ghost Ships’. I also love your description of ‘Gun for the Devil’. Reading these quotes makes me think that Angela Carter’s prose became more and more beautiful with time. Do you think that is true? Thansk, Vishy. I just love that story and had to quote it. I’m sure you’d like it. In the foreword Susannah Clapp writes that she was even sadder about Carter’s death after aving read this collection as it showed that she would have had to offer even more. So, yes, I think it got more enchanting even. Caroline, your wonderful review has persuaded me to give this collection a try. I never felt terribly drawn to it because of all the references to US culture and films, which I assumed I wouldn’t understand. But now I would like to make the effort. I second Violet in thanking you and Delia for hosting this, I’ve discovered some lovely new blogs as well as books because of it. Thansk, Helen, I hope you will like it. I’d be very interested to read another review that would hopefully shed some light on a few things that are still not clear. Thank you for joining us, Helen. It was a pleasure. Like you, I discovered new blogs as well. Oh, and I wanted to add, that reading many different points of view on the same books has been really enriching in terms of those books and others of Carter’s works, connexions start popping up all over the place. It’s the sort of experience that blogging makes possible and which is perhaps unique to blogging, don’t you think? Yes, I agree. I thought it was an amazing experience and I would like to do that again. Maybe she was a particularly great choice. I hosted an Antonio Tabucchi week two years ago and he was quite good in that regard as well. The more organic a work is, the more connexions there are, the greater it is. I think that blogging is indeed unique in this. Wonderful! I will definitely be tracking this collection down. It has some awsemoe stories in it. I hope you’ll like it. 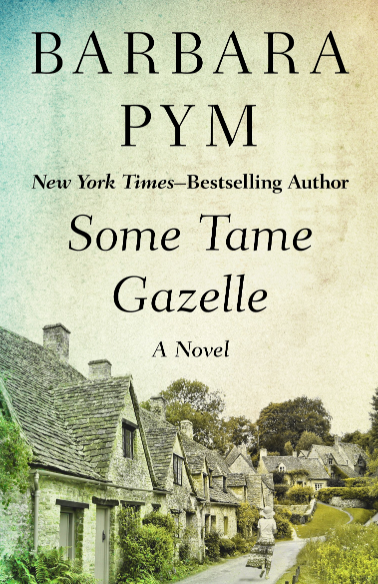 Lovely review, alas only confirming that Carter is probably a wonderful writer…but for other readers. I was annoyed by all the references I couldn’t understand in Encyclopaedia of Snow and I think I would be equally lost if I tried to read this. I lack the necessary cultural background. Still, I’m always glad to hear about a new writer. I haven’t read Encyclopedia of Snow yet but I think you’d like many of Carter’s stories, especially in this collection but she’s not a writer you can read quickly. Violet said best in one of her posts – you should do a line by line close reading to fully understand. I agree that the more you can decipher, the better it gets. This sounds good, although I find her stories a bit recycled – there’s a character named Lizzie In Nights at the Circus and she works – where else – at the circus. And of course, there are tigers as well. It starts to be a bit repetitive after a while. I’m glad I read The Secret Chamber first, that was a little gem of a book. Yes, that’s true, there are patterns and repetitions. I find that interesting. She looks at the same stories, symbols and metaphors again and again. I think you’d like some of her earlier novels. This sounds fascinating. It is amazing how much ground Angela Carter covered in her career. I have just read her collection of short stories, Fireworks, which includes stories based on Carter’s own experiences of living in Japan. It is just incredible how many themes, cultures, time periods she covers. I need to keep an eye out for American Ghosts and Old World Wonders, thank you for the interesting review. Thanks, yasmine rose. Her writing was so diverse and this last book shows that she would have gone into many new directions. I’ve read Fireworks years ago and it’s so different from this. I just had out my copy of her Collected Stories this weekend and almost read The Ghost Ships, as you know I love ghost stories, but after just one page I discovered I was not in the mood for it, and now that I see your comment am glad I passed on it for now. I read one of her Lizzie Borden stories years ago (I think it is in the Bloody Chambers collection?) and I am pretty sure this other story is in the Collected Stories, so perhaps I will give that a go. I started The Snow Pavilion (I think that is the title…have you read it–I think it might be in a different collection however), but now I think I will also look for Merchant of Shadows…. I have The Snow Pavillion in a collection called The Weird – huge book. I need to write about it some day. It’s not in any of her original collections. The other Lizzie Borden story is in Black Venus. Ghost Ships wasn’t my favourite, That and In Pantoland were a bit annoying to be honest. At least for me. The Merchant of Shadows is stunning. I hope you ennojoy it as well. Very interesting – I knew nothing about this collection of stories before your review and now I feel able to invest in it one of these days. Thank you – I adore The Bloody Chamber, and whilst I doubt this will meet such high standards, it sounds eminently worth reading. It is interesting and I would love to hear your thoughts on this. The colections have similarities but this one covers a vaster territory. The langauge though is less refined, I’d say. Yes, I love that too. She was so creative. Maybe you could try and read a story online. She covers a lot of topics you’d like but she’s not everyone’s cup of tea.